Wildfires, flash floods, tornados. Our state has faced no shortage of unplanned challenges recently. In addition to causing more serious repercussions, these challenges strain our transportation system, particularly when they hit during a busy season of planned construction closures. Add it all up and you end up with a predictable outcome: delays and frustration for travelers trying to reach their destination. Today, as scheduled, we wrapped up a four-day closure of State Route 99 in Seattle that included two rare weekday closures of the highway. Before the closure started, we asked you to do your part to help. We suggested you plan ahead, change your travel mode or revise your commute, among other measures aimed at reducing congestion. As you did during major lane reductions on I-90 last month, you delivered. Traffic was more challenging than usual, but we expected that. And had you not heeded our suggestions, things would have been much, much worse. Of course when you’re sitting in traffic, it’s easy to forget that the headaches we’re enduring have tangible benefits. In the case of the four-day SR 99 closure, we came away with plenty to show. Most notably, crews building the future north portal of the SR 99 tunnel demolished and replaced the section of SR 99 that crosses above Broad Street in Seattle. It looks easy in this time-lapse video, but completing this work and reopening the highway in four days was no small feat. During the weekend portion of the closure, crews replaced 81 concrete panels on SR 99 south of downtown, repaired an expansion joint at the Seneca Street off-ramp from northbound SR 99 and cleared ivy from the Alaskan Way Viaduct to make future maintenance of the structure easier. With more than 18,000 miles of highway under our care, we’re always getting ready for the next big push. There will be more closures, more travel challenges. But please be assured that we spend a significant amount of time and energy coordinating our work in advance, and doing everything we can to minimize delays for the traveling public. When the next big closure approaches, we’ll again ask for your help. Let me say in advance, on behalf of your fellow travelers, thank you. Your help, and your patience, benefit everyone as we work together to maintain and improve our state’s transportation system. 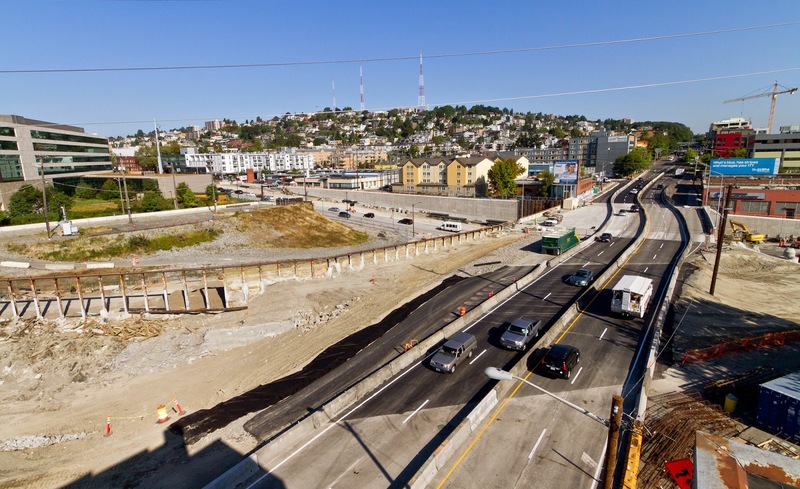 This entry was posted on Wednesday, August 27, 2014 at 4:26 PM and is filed under Alaskan Way Viaduct, AWV, Broad Street, four-day closure, Seattle, SR 99, SR 99 Alaskan Way Viaduct, SR 99 closure, State Route 99. You can follow any responses to this entry through the RSS 2.0. You can leave a response.